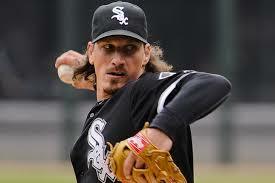 Jeff Samardzija signed with the San Francisco Giants in a 5 year, $90 million deal. Jeff Samardzija is off the market! The San Francisco Giants were able to come to terms with the right-hander on Saturday afternoon in a five year deal worth $90 million. A former relief pitcher, the thirty-year old has had over two hundred innings of work the last three season, with 2015 with the Chicago White Sox being one of the weakest yet, due mostly to a lack of offensive help.He allowed a Major League high of 228 hits and had a career high 4.96 ERA and a 11-13 record. In his eight seasons of big league play, (which includes playing with the Chicago Cubs, Oakland Athletics and Chicago White Sox) has a career 47-61 record with a 4.09 ERA. Due to a declining qualifying offer with the Chicago White Sox, the San Francisco Giants lose a first round draft pick with signing of Samardzija.